Award winning 2016. The first super camper and still the best. Ideal for 2-3 people, and lovers of external cooking. The Quantum SIV is a 14ft, luxury camper that features an innovative external kitchen layout that allows for more living space under the external awning area. The body adopts our new manufacturing technique of the fibreglass monocoque body. This updated body design increases strength and stiffness, reduces tare weight, only 1770 kg and guarantees dustproofing like no other trailer on the market. It has a narrow body width, just 1950mm wide for easy access to those remote camp spots and 4×4 tracks. Features a standard full-size queen bed with optional bunk and internal ensuite with hot shower and marine macerator toilet system with 140 litre capacity providing all the creature comforts of home in a stylish European décor with large water storage plus the benefits of an advanced solar system and AOR’s proven off-road technology. For the lovers of outside cooking, the Quantum comes standard with full L-shaped stainless-steel external kitchen, generous pantry areas, 3 burner gas stove with glass top for extra bench space and a 82L fridge freezer. The Quantum Series IV can pretty much go-anywhere off road. It oozes quality and strength, following you flawlessly through the steep hills and gullies of the Victorian High Country, fording rivers and squeezing through weeds and grasses as high as the roof, between trees and up loose surfaces. 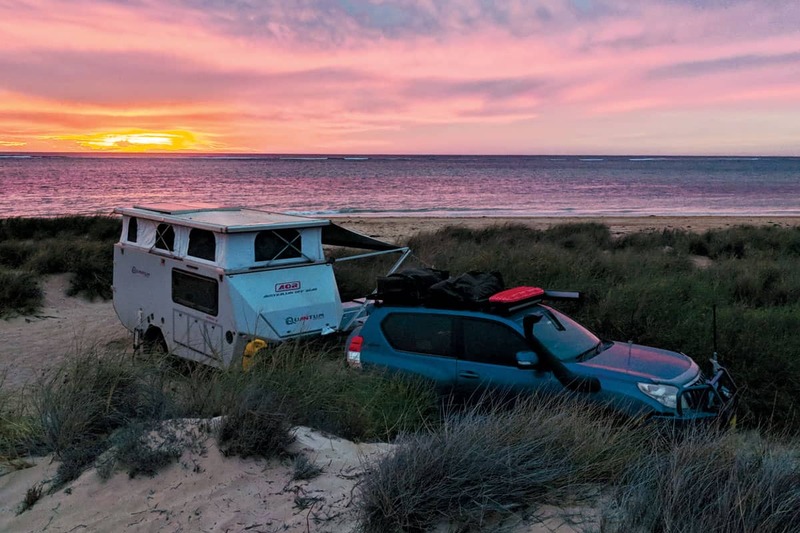 This really is Australia’s most self-sufficient, elegant, Off Road Super Camper. The photos in this gallery display standard and option features of the Quantum.